A Bride On A Budget was provided these cuff links for this review. All thoughts and opinions are property of A Bride On A Budget. What I've learned about weddings is that there are a lot of feelings involved. I don't mean just the love between the bride and the groom. That's there too, but there's a lot of other feelings that can get hurt. If you don't invite your aunt Sally's next door neighbor from childhood, she gets upset. If you choose to not have a vegetarian option, your sister who swore of bacon last week gets upset. And then there are feelings of being overwhelmed, of trying to do everything right, wanting to honor and respect everyone. That's where I was at for a while. I was trying to think of a way to honor Pete's mother, who passed from breast cancer, without making a big to do about it. One of my friends suggested a bouquet of flowers on a seat in the church pew; Pinterest suggested leaving a photo of the deceased loved one on a chair. But my issue with both of those ideas was: What do you do after? Do you carry those flowers or that photo to the reception? Do you move the photo to a chair? Or do you leave it behind -- and then feel guilty. I was looking at something else, when an idea popped into my head. The idea that is inside this box from Cuff Smart. I wanted Pete to have a way to honor his mother all day, but not some huge display that would take away from our celebration, one that wouldn't change people's happy feelings into those of mourning. 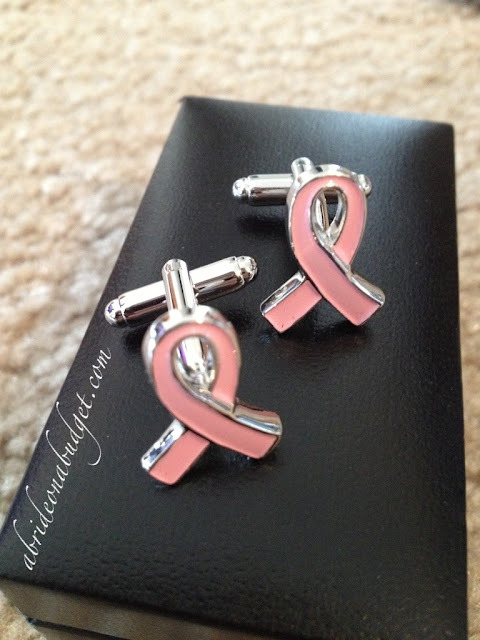 I got him pink ribbon cuff links from CuffSmart. I dreamed them up, and they appeared (with a little help from Google). See, I was looking at another site, and cuff links came up. I saw these ones that were a pink knot (which is so very hot right now) and it made me think of a pink ribbon. I googled, and Cuff Smart came up. Cuff Smart has more cuff links than I can even get through. I've been spending quite a bit of time on the site recently, bookmarking all my favorites. Right now, my list is topped with the Father of the Bride and Father of the Groom cuff links. Both pairs are affordable, which is great because realistically, I would give these to my dad and Pete's dad at the rehearsal dinner and they would wear them on our wedding day only (I'm the only girl in my family and Pete is the only guy in his, so these wouldn't get reused by our dads). They are so sweet and so perfect, though, that they are on my to buy list. If you would rather something a little more laid back, CuffSmart has a ton of novelty cuff links. There's electric guitar cuff links for the musician in your life, Batman for your comic book lover, and of course, there are the ribbons. I got the pink ribbons because, as I said, Pete's mom passed from breast cancer. So I'll gift these to him sometime before the wedding so that he can wear them and have his mom with him all day on our special day. 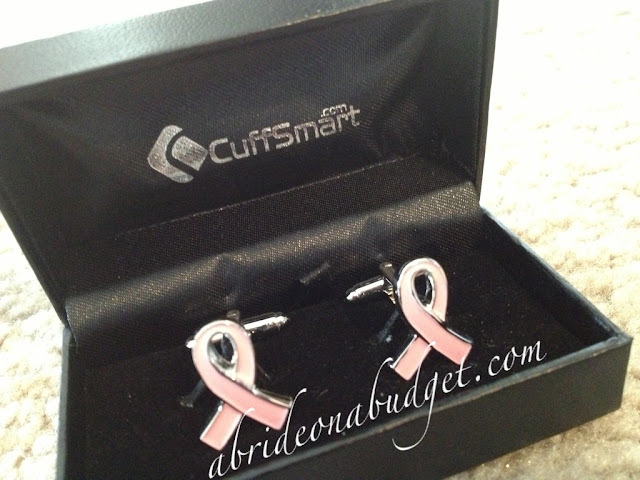 Pink isn't the only ribbon color CuffSmart sells. There's yellow for the troops, red for AIDS, and purple for cancer. You can see them all here. There are also other "awareness" cuff links, such as a puzzle piece for autism and a mustache one for Movember. Plus, 25% of the proceeds from each of these goes to support the group the ribbon is supporting (for example, 25% of the proceeds from the sale of the mustache cuff links goes to support prostate cancer research). It's such a beautiful thing. The cuff links themselves are also really beautiful. They have a bullet back closure (which you can see in that photo above). I much prefer cuff links like this as opposed to a fixed backing, which doesn't move and I always feel has a chance of removing itself from the hole, resulting in a lost cuff link. I've been pretty much manhandling these cuff links since I got them and the pink enamel shows no finger prints. The cuff links are rhodium plated, so they're really shiny but you will see fingerprints on the silver part if you look closely. On your wedding day, your groom is definitely going to be feeling nervous so I can imagine these cuff links will be touched by someone with steady hands. No one has to worry about cleaning them after they're on because the pink ribbon will still look perfect. BRIDAL BABBLE: What do you think of cuff links as a way to honor someone at a wedding? I think this is an amazing way to honor his mother! Those cuffs are perfect. Glad you found that website! This is such a unique and special thing for you guys and I know that he is going to LOVE it! Finding such a special way to honor his mother makes you amazing! Their entire selection is really nice! Thanks for such a great review! I LOVE the cuff links. Great and fashionable way to spread the important message of hope!! What a sweet way to bring Pete's mom into your special day. he will be touched! I love these. This is a great way of honoring a loved one in a special and discreet way. What a great way to honor Pete's mother. I am sure he's going to love them as much as you do. What a lovely idea, so fitting and special, such a caring, thoughtful gift. Bless you both in your marriage. Giving these cuff links to your fiance is such a moving way to show him you care. I love the idea of giving cuff links. What a touching way to show how you feel for him, and want his mother to be a part of your new life together even if it must be in spirit. This post brought tears to my eyes. I will definitely be sharing this with my sister in law, they lost their father, and My husband will be walking her down the aisle in the near future. Cuff links in his honor is a great way for them to remember their Dad too. I love this idea and the Cuff links are beautiful! What a sweet and thoughtful gesture. I love that part of the proceeds benefit a good cause. I think cufflinks are an elegant way to honor someone at a wedding. These are lovely! The fact that the purchase benefits a cause makes them even nicer! My hubby wears them every day!